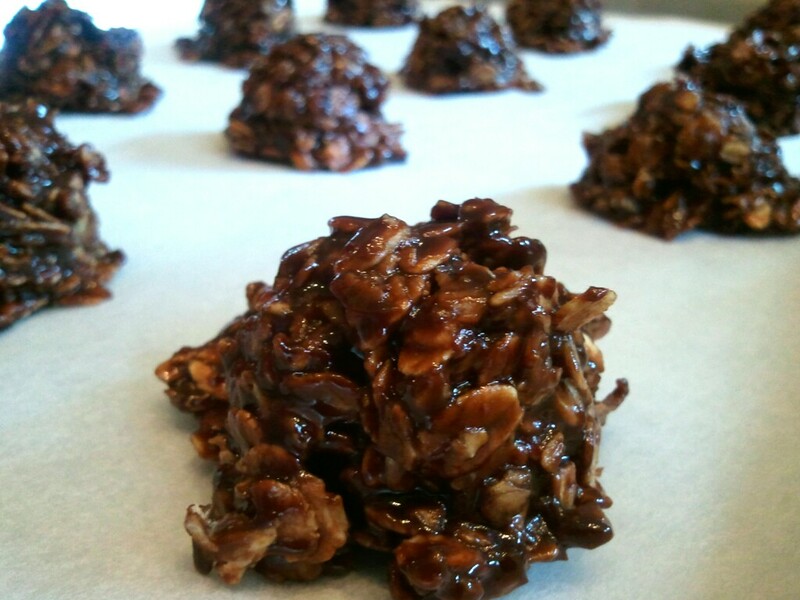 The No Bake Cookie. The easiest cookie to make known to man, right? Since we had such a huge response with the Homemade Luna Bars (sweetened with agave nectar), I thought we would give the agave another shake with these delicious no bake cookies. I am by no means claiming these to be “healthy.” But agave is such is a good alternative to white sugar. Agave does not give your blood a spike and then crash like a good dose of white sugar will do. That really appeals to me since I have a 3 and a 5 year old who are sugaraholics. (Love to deal with them 15 minutes after eating a popsicle) Aren’t those sugar crashes fun? Agave Nectar can also be a good source for iron, soluble fiber, and calcium. While I am no expert on agave, I do have to say that it seems to be a “healthier” choice than white sugar and I will try to use it more often! Put rolled oats in a medium sized mixing bowl and set aside. In a medium sauce pan on medium heat, mix agave nectar and cocoa. Add milk and butter. Stir constantly over medium heat, and bring to a boil. Boil for one minute. Remove from heat. Stir in peanut butter, vanilla, salt. Poor chocolate mixture over rolled oats. Stir until combined. If mixture is too runny, add more oats. Drop by spoonfuls onto parchment lined cookie sheets. Put in the fridge for about 30 minutes to let cookies set. Yields about 18 one inch cookies. Thank you! I will try these out. Just wanted to say thank you for this recipe. My family loves to 1/3 this recipe to make a great Sunday evening treat. We usually use no sugar added natural peanut butter and heat everything in the microwave to make it quicker. I also sometimes chop the oats in a blender so they soften and soak more thoroughly. ONB cookies have been my favorite since I was young. I usually make them to remind me of home. We used to use my grandma’s recipe (pre-Google days). I made these today using your recipe. Had to add a little bit of oats in the end just like you said. These are not as sweet as I remember ONB cookies to be. But, I like them. Thank you for sharing!